PT Toyota Astra Financial Services - TAF is an established financial service company headquartered in Jakarta. 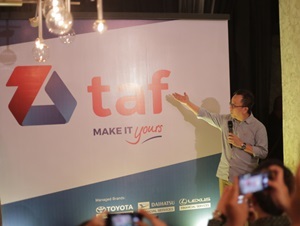 TAF has core competencies in auto financing for Toyota, Daihatsu and Lexus brands. TAF offers a wide range of auto finance products which include Consumer Vehicle Financing, Business Vehicle Financing, Vehicle Financial Leasing as well as Value Added Product. PT Toyota Astra Financial Services is a multinational joint venture company between Indonesian large diversified business conglomerates, PT Astra International Tbk (Astra Group) with a financial services subsidiary of Toyota Motor Corporation, Toyota Financial Services Corporation (TFSC), respectively 50% and 50%. At present, TAF runs its business through 32 branch offices and 1 representative office spread across Indonesia. PT Toyota Astra Financial Services generally recorded a good performance in 2016. According to PT Toyota Astra Financial Services Annual Report 2016 as cited by JobsCDC.com, TAF booked total net incomeof Rp 350.5 billion in 2016. This number reflected an 14.43% increase from Rp 306.3 billion in 2015. TAF's total income in 2016 was Rp 2,594 billion. This total income number is up 19.32% from Rp 2,174 billion in 2015. Young candidate with the maximum age of 26 years old. Graduated from reputable university in any field with minimum GPA of 3.00. Both professional (with less than 2 years of experience) or fresh graduate candidates are welcome to apply. Excellent personal quality in continuous learning, analytical thinking, teamwork and achievement. JobsCDC.com now available on android device. Download now on Google Play here. Please be aware of recruitment fraud. The entire stage of this selection process is free of charge. PT Toyota Astra Financial Services - TADP Management Trainee Program TAF January 2018 will never ask for fees or upfront payments for any purposes during the recruitment process such as transportation and accommodation.